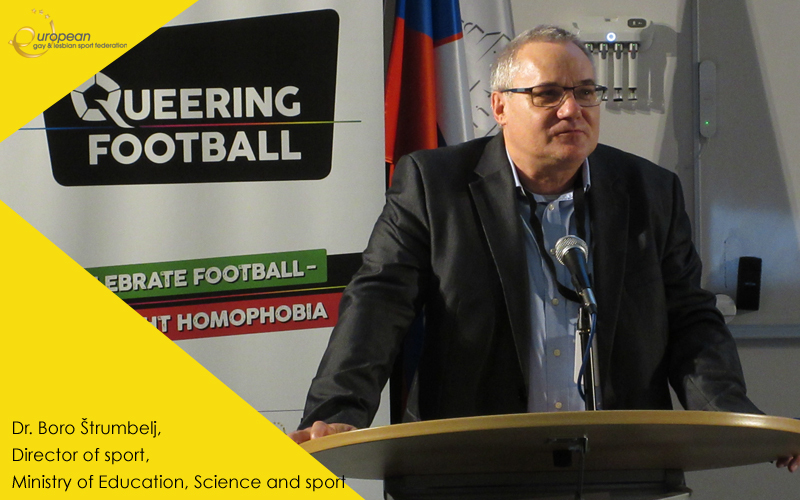 At the Faculty of Sport of the University of Ljubljana, the European Networking Conference QUEERING FOOTBALL – Addressing Homophobia at Mega Sport Events kicked off. 17 countries and 3 continents are represented by over 70 participants – including activists, students, journalists, volunteers, practitioners, researchers, and representatives of NGO’s, sporting and public bodies. The Conference Coordinator – Dr. Milan Hosta, director of the SPOLINT Institute of sport development – welcomed the participants: “Discrimination and intolerance are mother and father, violence is the son. Anytime we witness discrimination and intolerance, fear and violence, we should react, especially in sport. Let's discuss these topics, considered as taboos, so they won't be anymore taboos”. Dr Boro Štrumbelj, Director for sport at the Slovenian Ministry of Education, Science and Sport, affirmed that “We should be aware that Europe was promoter of human rights, but also the place where the first and second world wars started. Conferences as this one should be held in many countries to share practices and address issues in the right way. Sport is important because is visible to many people, so we should have zero tolerance policies in any sporting events”. Tanja Hodnik, head of the social care office of the City of Ljubljana: “We are proud to support LGBT people in different areas, culture, sports, leisure time and other areas”. Miha Lobnik, Advocate of the principle of equality in Slovenia was also present: “It is not only about sanctioning, but about positive approach, about identifying champions and role models to approach the problems in positive way. Athletes have great potential; we should understand how to engage them”. The two-day program includes sessions on homophobia, human rights, prejudice and violence against LGBTIQs in the context of sport and football. Particular emphasis will be placed on the forthcoming final phase of the FIFA World Cup 2018 in Russia. The conference includes workshops, plenary sessions and panel presentations. Cross-sector and cross-border networking, participation of attendees, the exchange of experience, good practices, ideas, approaches and opinions will be particularly encouraged. The event is organised by the SPOLINT Institute of sport development, in cooperation with the Vienna Institute for Dialogue and Cooperation and the University of Ljubljana. The initiative is part of “Queering football” a project co-funded by the EU and coordinated by the Vienna Institute for Cooperation and Dialogue. Nikola Staritz is the project coordinator: “There have been progresses, more and more grass-root initiatives tackle homophobia. But still it is often not recognised on a policy level. We have still a lot of work to do”.